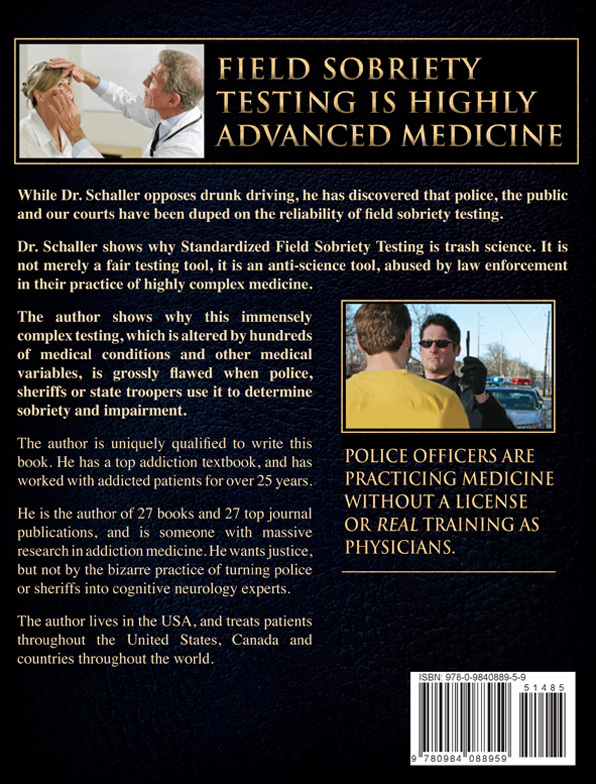 James Schaller MD is a top rated prolific physician with awards from physicians and patients, has turned his research against routine roadside medical testing which is called "standardized field sobriety testing." His conclusions after reading thousands of medical and science documents is that field sobriety testing is anti-science. He is currently working on two texts on this topic and in these he examines real world arrests and examinations by sheriffs and police. He is stunned that the American public and the attorney generals of local and states have fallen so low as to use high school graduate sheriffs and police to do testing that requires specialized testing for a top educated physician. The level of medical expertise to rule out the 500 plus medical issues is impossible for any but a highly trained and advanced physician who has spent time mastering this agility, gait and neuronal medical science over at least two years of full-time reading. So having some sheriff or police officer with a high school or perhaps a college degree is worthless in having this advanced medical understanding. 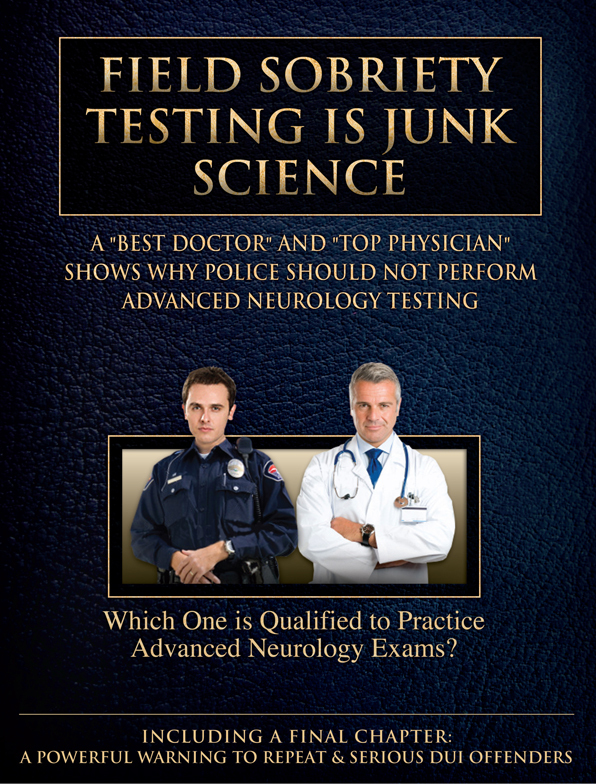 Simply, Dr. Schaller's position is it is impossible for a sheriff, police officer or trooper to practice MEDICINE AS A SUPER-SPECIALIZED COORDINATION NEUROLOGIST WITH VETERAN MEDICAL EXPERIENCE SUCH AS IS REQUIRED IN FIELD SOBRIETY MEDICAL TESTING. FST is the practice of advanced and highly specialized medicine without a medical license. Note: Text is continued below the cover images. Cole, who is an expert in the field of human biometric measurements, says that one of the problems with the tests is that "there is no average score for passing these evaluations, making comparisons difficult". Since Dr. Cole began studying the validity of field sobriety tests in the 1980s, he determined that such field tests are neither valid nor reliable. Cole also cited a study from the 1970s in which police officers watched field sobriety tests being conducted on video and incorrectly identified nearly 47 percent of the subjects as being impaired by alcohol. Dr. Schaller would add hundreds of points that undermine FST, starting with the issue that one test alone have over 25 commends. The fact no police office, highway administrator, PhD, or any pro-FST writer missed this fact is stunning. This is basic college physiology. The brain can handle a very small number of inputs. But the sneaky game with one test of agility is that it is not 5 or 10 commands, but huge numbers of small commands that are impossible for many sober people to follow. One criteria for this test to accepted is the officer has to administer it perfectly. Schaller doubts 1/20 performs it EXACTLY as defined by the Highway Association that approves this test. Finally, field sobriety testing has a cult-like authority since almost all scientists are not allowed to examine it. If any science or medical test rejects critical thinking, it is not science, but junk or cult science.